Scarf is 5-1/2" X 58"
New! You can now make two different sized scarves: 58” and 40”. New! 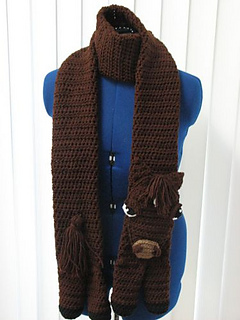 There are also instructions included on how to make a single layer scarf. 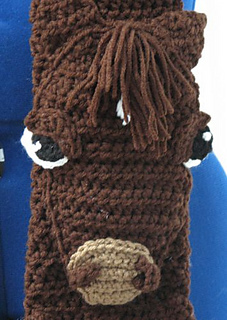 Scarf features a lovely horse’s head complete with center mane. 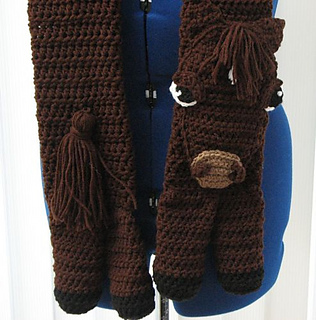 The scarf also has a large tassel tail. The scarf uses 14 oz Red Heart Yarn, size J & H crochet hooks, small amount of White, Black and Cafe Latte yarns, needle to take yarn and a small amount of stuffing (fiberfil). The scarf is made first using the larger hook in order to keep it light and airy. The head is made (H hook) and then the eyes, muzzle, nostrils, ears and mane is layered on to give it this great Horse look. This is a pattern of my own design. Any item you make from one of my patterns you may sell. You can not sell or give the pattern away.